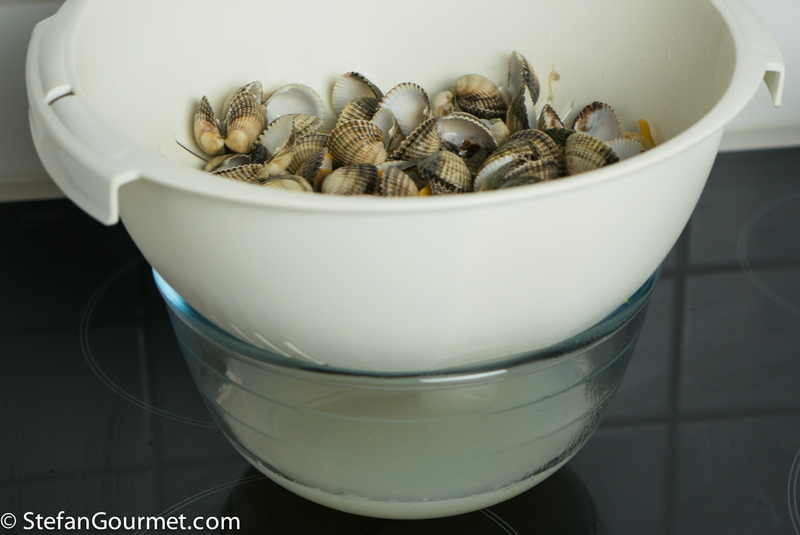 Soak the clams in water as salty as the sea (30 grams or 4 tsp of salt in a litre/quart of water) to remove any sand, then rinse them and put them in a large saucepan with 250 ml (1 cup) of water. 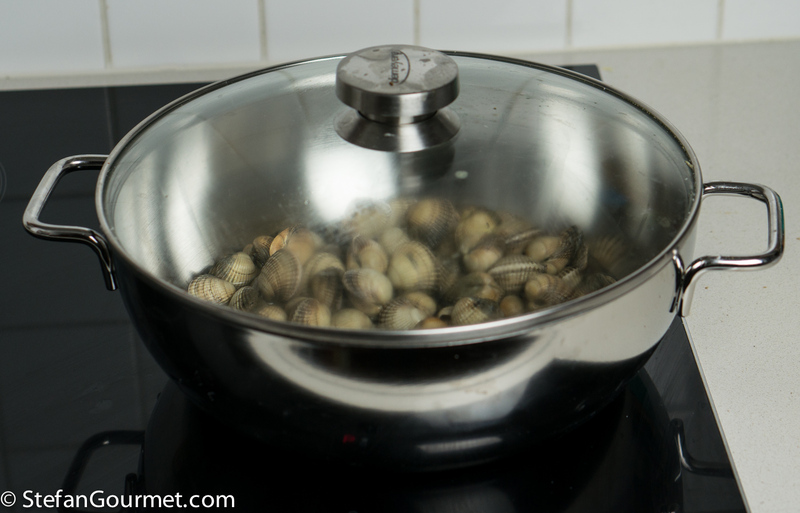 Cook only as long as needed for the clams to open, then turn off the heat. Drain the clams, catching the liquid. Filter the liquid with a fine sieve. You will need 500 ml (2 cups) of clam juice. If it is less, add as much water as needed. Dice the celery, onion, and potato. 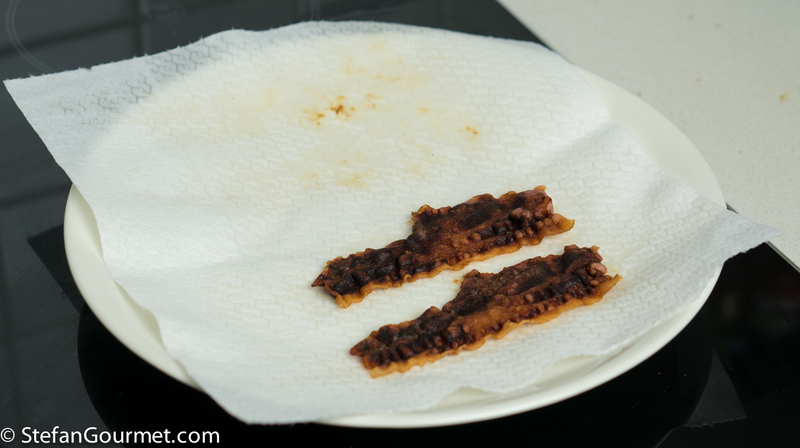 Cook the bacon between sheets of kitchen paper in the microwave until the fat has rendered, then allow to cool and crisp up. 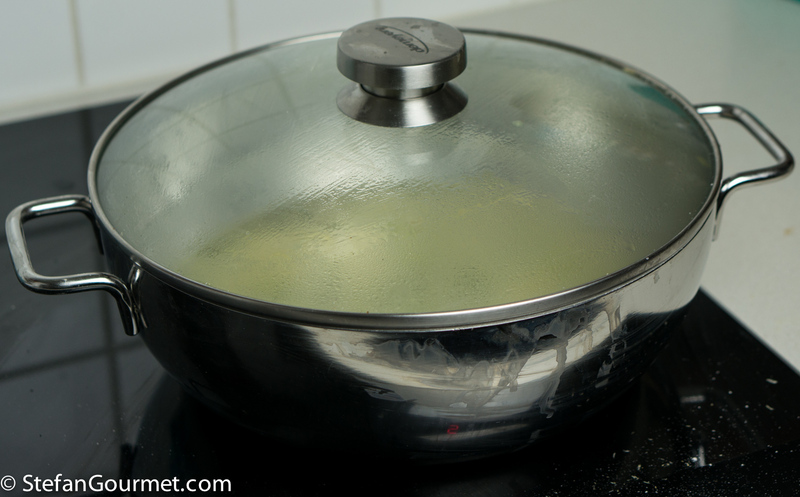 Melt 25 grams (2 Tbsp) of butter in a large saucepan. 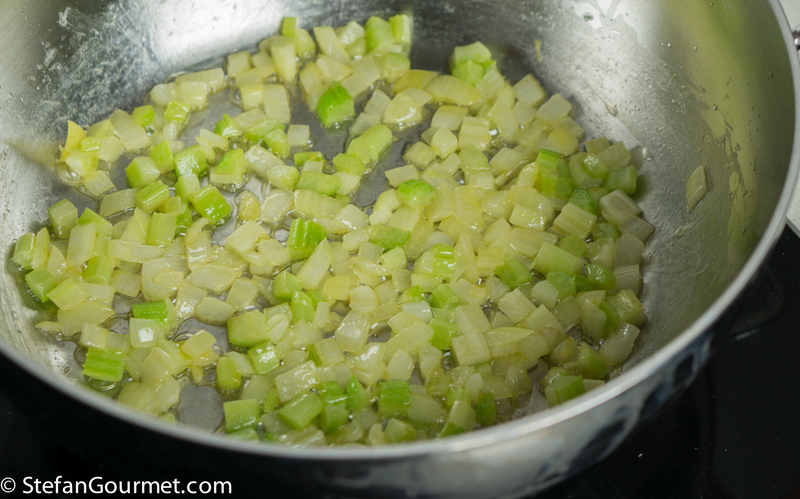 Add the celery and onion and stir for a couple of minutes over medium heat. Do not allow the vegetables to brown as that will ruin the nice white color. 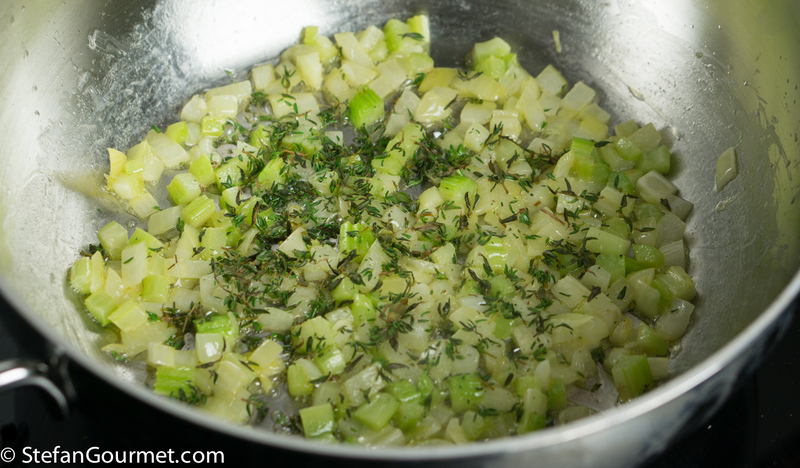 Add a tablespoon of fresh thyme leaves. 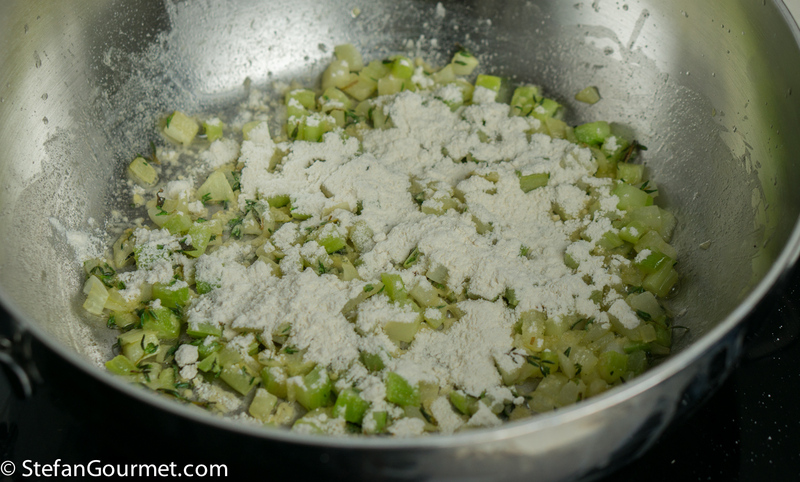 Add 25 grams (2 Tbsp) of flour. 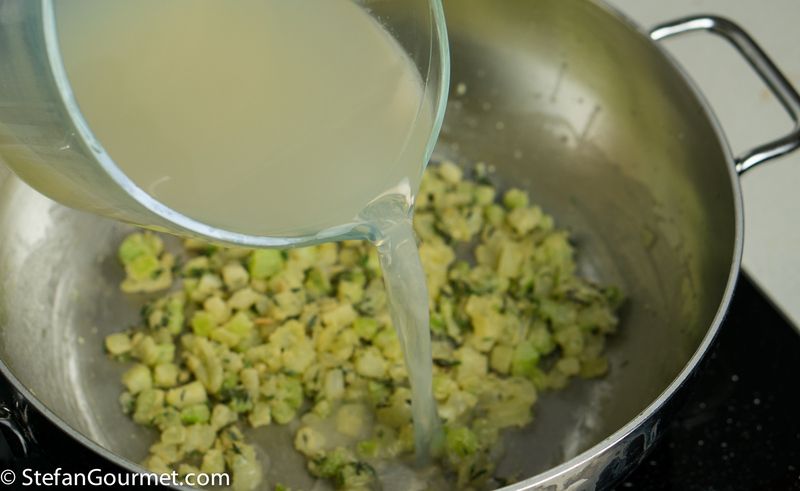 Add 500 ml (2 cups) of clam juice. 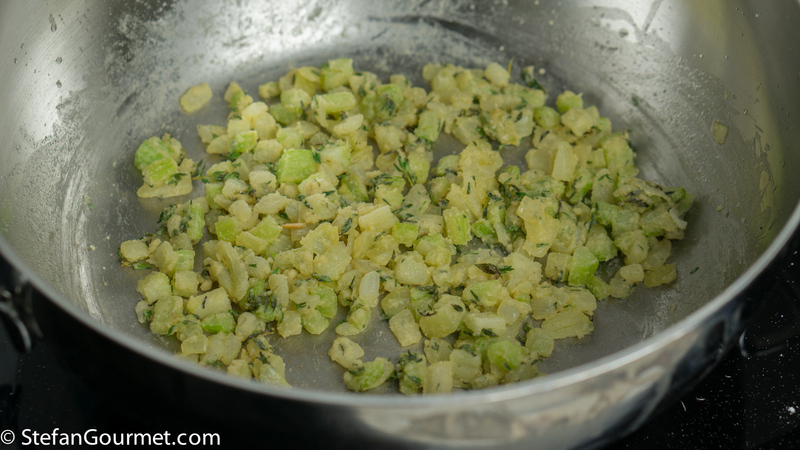 Add the potatoes and bring to a boil. Season with freshly ground black pepper. 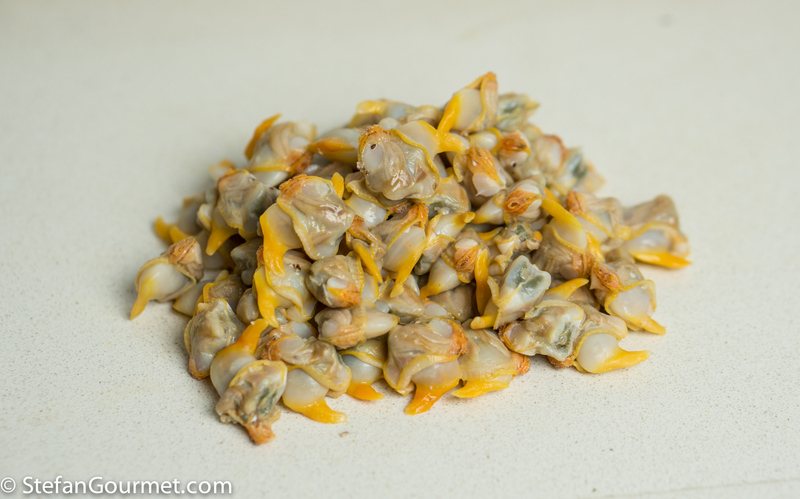 Taste and add salt only as needed, as the clam juice is already quite salty. 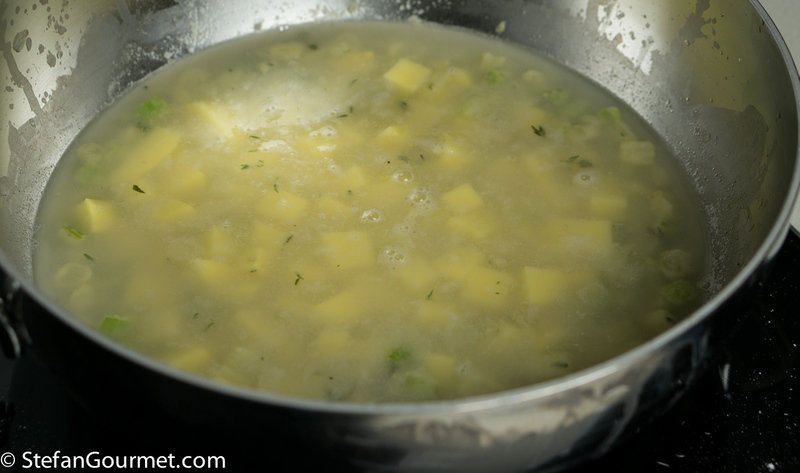 Cover and reduce the heat to a simmer, and cook until the potatoes are just tender, about 15 minutes. Meanwhile, take the clam meat out of the shells. 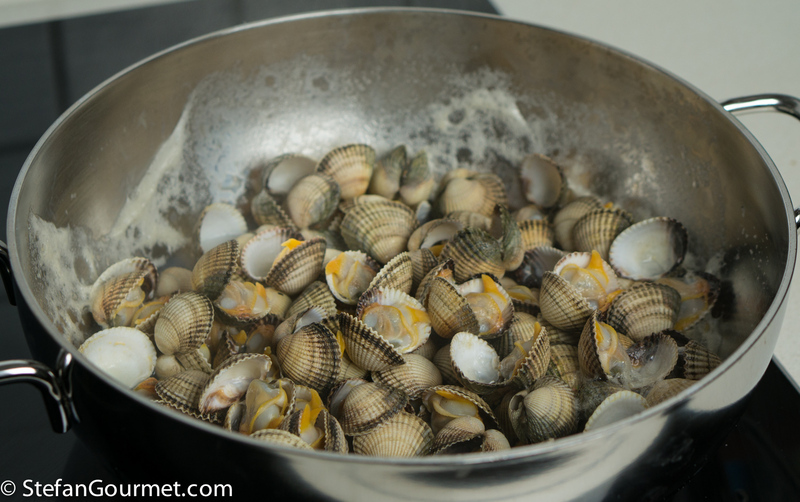 You should end up with about 200 grams of clam meat (so a yield of 20%). Check whether the potatoes are cooked, then reduce the heat to low. 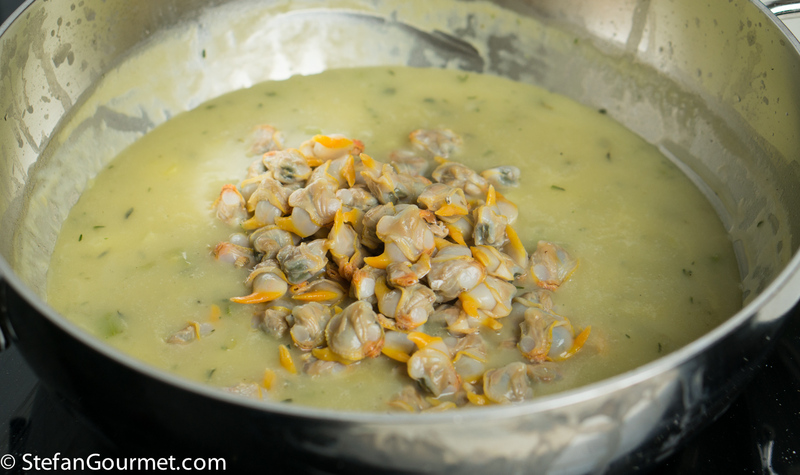 Add the clam meat, stir to incorporate, and cook for a minute or so over low heat until the clam meat has been warmed through. 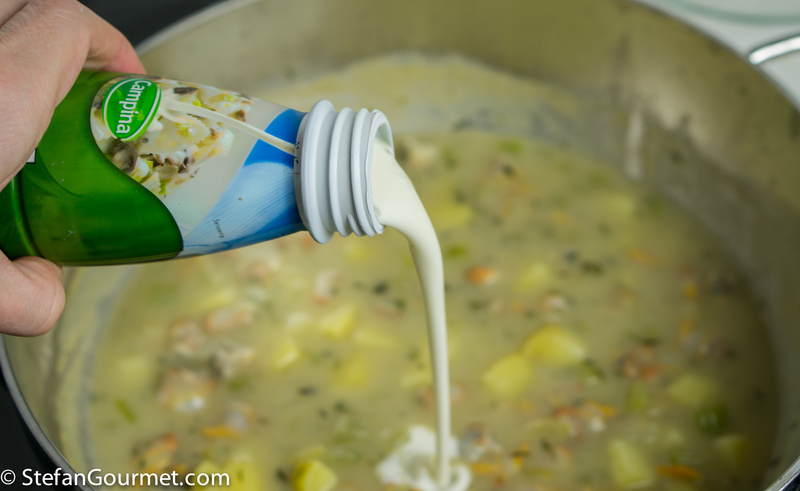 Add 125 ml (1/2 cup) of light cream, half-and-half, or half milk and half cream. Allow to warm through over low heat, do now allow to boil. Taste and adjust the seasoning one final time with salt and freshly ground white pepper. Serve in bowls and crumble the bacon on top. 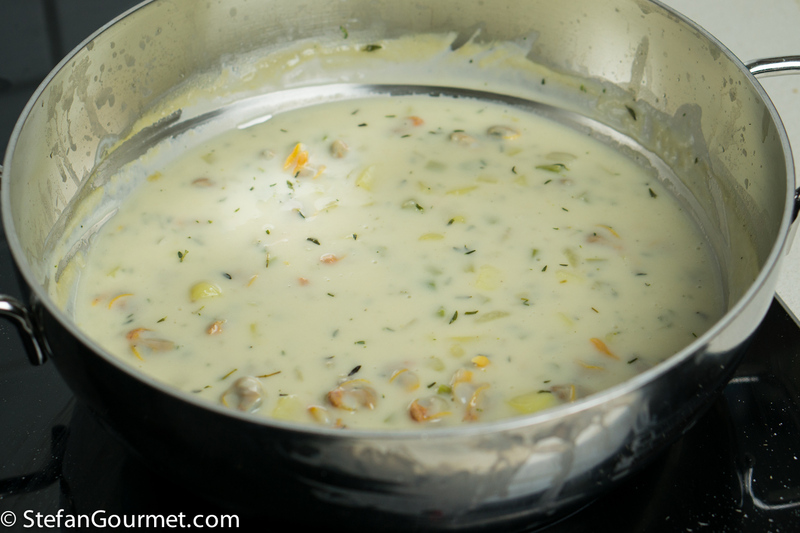 This creamy shellfish soup is great with a chardonnay from Burgundy. Meursault, Chablis, Chassagne-Montrachet or Puligny-Montrachet could all work, but it depends on the producer and vintage. 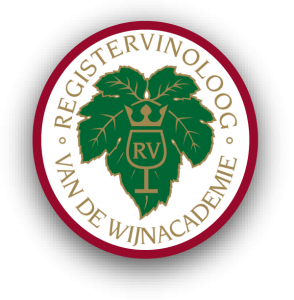 The wine should be creamy and not too high in acidity, preferably with a nice minerality to it. 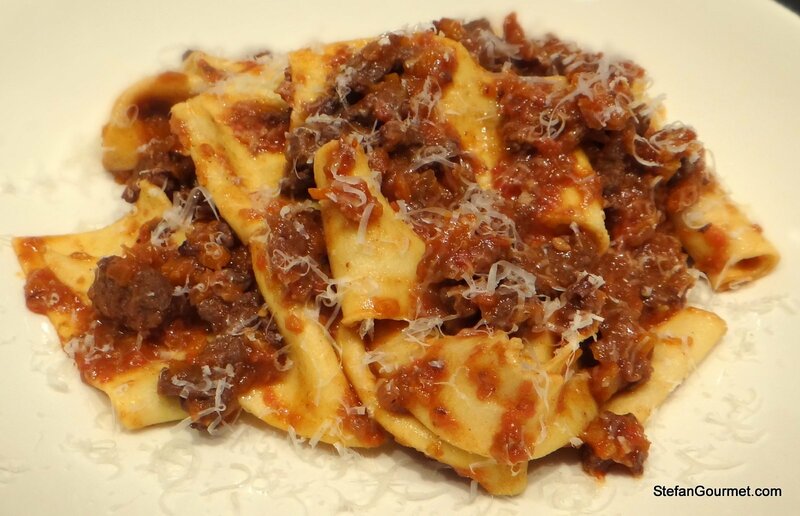 Pappardelle al ragù di Cinghiale is a classic pasta dish from Tuscany that is perfect for autumn: fresh wide ribbons of pasta with a wild boar and tomato sauce. I loved Anatoli’s post it was wonderful. Your chowder looks just perfect. I really love the creamy clam chowders. I first tasted New England Clam Chowder in Boston. Yours looks as wonderful as the one I remember. More delightful homework and a very interesting link! Methinks I have only ever had and made New England clam chowder but just have to look up and try both Manhattan and Rhode Island . . . that sounds the most ‘purist’ of all. Stefan, thank you for your kind words! You recipe and the end result looks as classic as they can be! How did you like the final product? Your chowder sounds fantastic! 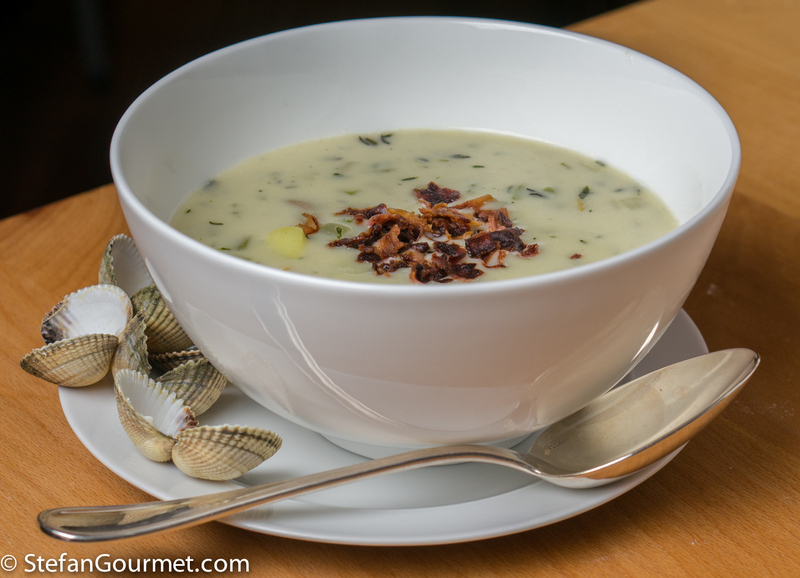 My dad, who is from New England, makes a fabulous fish chowder, but I’ve never actually tasted clam chowder, even though I really like clams alot. This recipe really makes me want to finally give it a try! I have yet to make it to New England and try one of the traditional recipes – I would choose this variety, the creamy one over the other, myself. Looks delicious! 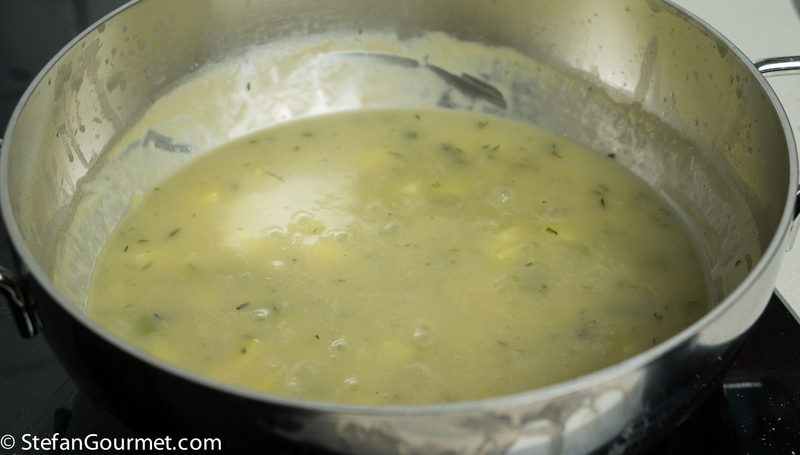 I love me a good bowl of New England Clam Chowder! In fact, I just had a bowl of it yesterday at a restaurant that we stopped at on our drive back from the coast. Your version looks perfect! Anatoli’s post was great and we talked about it last Sunday during a dinner/blind wine tasting hosted by a mutual friend! Stefano is obsessed with clam chowder. I think yours look wonderful and delicious! 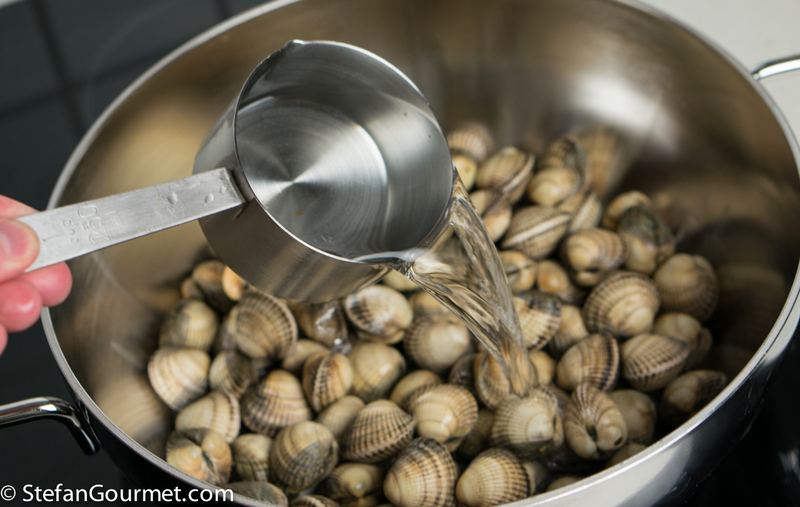 I have never used fresh clams, living in the Rocky Mountains but I would have used White wine and water to steam the clams. I would saute’ my veg in rendered bacon fat and a couple of anchovies. I also prefer whole cream only, and use potato starch instead of flour. Also very typical for Canadians is to use some or all Summer Savory as the herb of choice.